Today I have a clean and simple Autumn themed card for you, featuring a leaf stamp from Simon Says Stamp's One With Nature stamp set, along with one of my favourite sentiment stamps. I gold embossed my stamping, and added sequins from my Just Peachy collection. Lots of pretty sparkle on this card. Love these autumn tones… our weather at the moment is definitely more Autumn than Summer so it seems kind of fitting! The gold embossing look scrumptious on the kraft CS. Delightful card Lucy! Very autumnal...and pretty. Is it fall already? Did I miss summer entirely? Love this, Lucy! 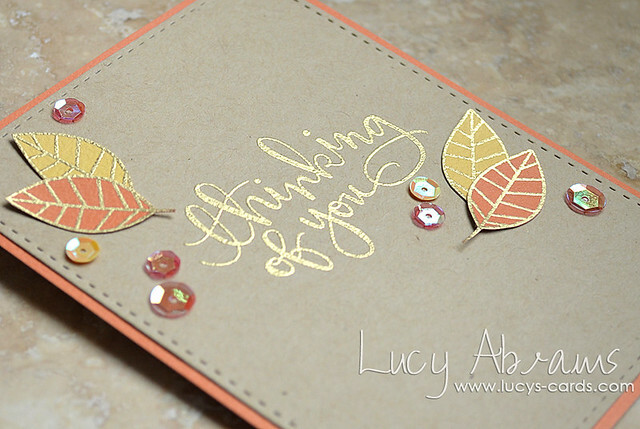 The gold embossing on kraft mixed with the fall colors is perfection! GORGEOUS! The colors, images, embossing, sequins----so perfect in every way!! Glad to hear you had a wonderful trip!!! Welcome back! so simple and so very pretty!